Freedom Alliance set up a catered luncheon to serve troops traveling through the Hartsfield-Jackson Atlanta International Airport, a Christmas tradition started by board member Rita Scott and her husband David in 2008. With red aprons and Santa hats, the Freedom Alliance team and volunteers met in the airport’s USO lounge, serving a complimentary holiday meal to troops coming through. Turkey, ham, stuffing, mashed potatoes, gravy, green beans, cranberry sauce, and two kinds of pie, all from Atlanta-based Williamson Brothers BBQ, made a very merry welcome-home for troops beginning their block leave (when a military unit takes their leave all at once, usually during Christmas). We met soldiers who had just graduated basic training, as well as non-commissioned officers (NCOs) who were there en masse to make sure the young service members made their flights. Others were returning from advanced training. There were drill instructors from Fort Benning, staff from Fort Stewart, and a company from Fort Gordon. 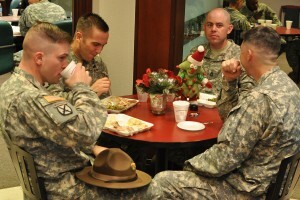 About 200 service members in all partook of a holiday meal, and Georgia USO CEO and president, Mary Lou Austin, was there to serve along with us. In addition to lunch, we also presented the troops with “Santa Sacks,” red-velvet, fur-lined bags stuffed with chocolate and thank-you notes. After lunch, our volunteers grabbed bags to give to the soldiers who didn’t make it to the USO lounge for the meal. Bystanders were struck by the sight of of our “Santas” handing out gifts to the men and women in uniform, who were flying in from bases all over to see their families. We gave out 120 Santa Sacks that day. Other than airports, our nation has service members in hospitals recovering from combat-related injury, emotional stress, and other trauma. 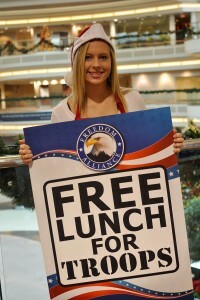 Also, at Brooke Army Medical Center in San Antonio, Texas, Freedom Alliance helped to sponsor a special holiday meal. More than 550 people attended, including patients, family members, hospital staff, and support personnel. Even Santa Claus himself and some elves made a stopover at the hospital in San Antonio to make it special for the children of patients and staff.